An atrocious start from Rick Porcello on Wednesday that saw him allow seven runs and seven hits in two innings at Toronto gives the Boston Red Sox another reason not to trade veteran right-hander Clay Buchholz, who is drawing interest from multiple teams. In his first five starts this season, Buchholz was 1-3 with a 5.76 ERA and a 1.56 WHIP. After an improved May, he logged a 4-0 mark, a 2.21 ERA and a 1.02 WHIP over six outings in June. His last three starts? The 30-year-old right-hander has surrendered a total of two runs and 19 hits over 22 innings with 15 strikeouts and two walks. Though the Red Sox are 36-44, they are just seven games out of first place in the mediocre American League East. Boston principal owner John Henry, general manager Ben Cherington and manager John Farrell have stated that they still believe in the club’s potential to rebound and contend. The Red Sox have a $13 million team option on Buchholz for 2016 and a $13.5 million team option for 2017. Those salaries are team friendly considering that Buchholz has shown the ability to serve as a top of the rotation arm, albeit in stretches over his nine-year big league career. 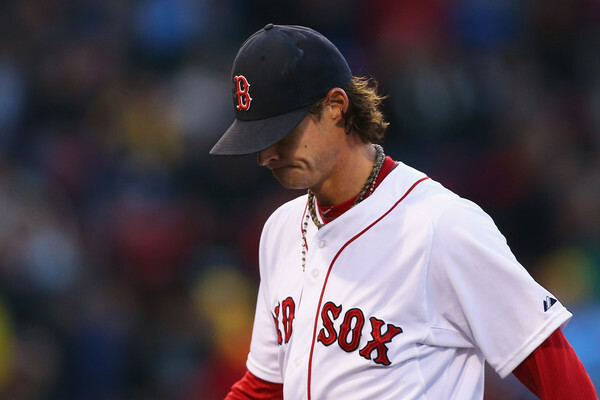 Buchholz has a track record of injury issues and inconsistency. He followed a 12-1 record, a 1.74 ERA and a 1.02 WHIP over 16 starts in Boston’s 2013 World Series championship season with a forgettable 8-11 record and a 5.34 ERA in 28 starts last year. He was 17-7 with a 2.33 ERA over 28 starts in 2010, 6-3 with a 3.48 ERA in 14 starts in 2011 and 11-8 with a 4.56 ERA in 29 starts in 2012. This year, Buchholz is one of the game’s top starting pitchers, according to Sabermetrics. He is fourth in the American League with a 2.67 FIP. Only Chris Sale, Chris Archer and Corey Kluber are better in that category. His fWAR of 2.7 ranks sixth among AL pitchers behind Sale, Archer, Kluber, Sonny Gray and David Price. In traditional stats, he is 6-6 with a 3.48 ERA and a 1.24 WHIP in 16 starts and 101 innings. It is ironic that Buchholz is the team’s most consistent starting pitcher. Top prospect Eduardo Rodriguez, a 22-year-old left-hander who is 4-2 with a 3.92 ERA and a 1.11 WHIP (including a win on Tuesday when he limited Toronto to one run and four hits over six innings), is considered a future top of the rotation arm, but he is only seven starts into his Major League career. Porcello, who was signed to a four-year, $82.5 million contract extension earlier this year, is mired in the worst season of his seven-year big league career. Expected to lead the Red Sox rotation, the 26-year-old right-hander fell to 4-9 with a 6.08 ERA, a 1.40 WHIP and a .295 batting average against after serving up the seven runs and seven hits to the Blue Jays on Wednesday. It was the fifth time in 16 starts this season that Porcello has allowed at least six runs. Though Porcello’s performance in previous campaigns – including a breakout 2014 season that saw him log a 15-13 record with a 3.43 ERA and a 1.23 WHIP over 32 appearances (31 starts) and 201.2 innings – suggests that this year’s numbers only represent a prolonged slump, the Red Sox cannot afford to rely on him. Justin Masterson – who is signed to a one-year, $9.5 million deal for 2015 – has struggled and just returned from the DL. Hard-throwing right-hander Joe Kelly was demoted to Triple-A Pawtucket after recording a 2-5 record, a 5.67 ERA and a 1.50 WHIP in 14 starts. Some scouts believe that Kelly can serve as an impact late-inning reliever, which is a role he could fill when he returns to the Red Sox. Left-hander Wade Miley has pitched effectively over his last seven starts with a 4-3 record and a 3.64 ERA. He represents a durable back of the rotation starter for the long term. The Red Sox still could acquire Philadelphia left-hander Cole Hamels, who would immediately become the club’s No. 1 starter, but that will cost a package of top prospects that might feature highly regarded left-handed starter Brian Johnson, outfielder Manuel Margot and corner infielder Rafael Devers. Even if Boston lands Hamels, it will still need a viable No. 2 arm, so the presence of Buchholz is needed for the remainder of the season. Whether or not the Red Sox rebound and contend this year, they will undoubtedly pursue a No. 1 starter this offseason if they do not acquire Hamels beforehand. Rodriguez is in the club’s long-term plans and could slot in at No. 3. Miley is signed long term and gives Boston a formidable No 4 arm. Johnson and fellow left-handed prospect Henry Owens could compete for a back of the rotation spot next year. Considering his ability to dominate opposing lineups, and his reasonable 2016 and 2017 team options, Buchholz will likely remain in Boston as a No. 2 starter (or a No. 3 if Rodriguez continues to flourish). That scenario could change if the Red Sox plummet further out of the AL East and wild card races, and a trade partner offers a top prospect that Cherington cannot resist (like when the Orioles sent Rodriguez to the Red Sox at last year’s trade deadline for Andrew Miller).